In reading about connectivism I find myself fascinated with how it describes the clear process that so many people take now when there is something they want to learn. In every day conversations, when a question arises that no one knows the answer to, inevitably someone will say, “Google it!” This is the world we now live in. The assignment this week in my Learning Theories and Instruction course at Walden University was to create a mind map of my network connections. Basically, break down how you learn and from what nodes I gain knowledge. I tackled this assignment from the same aspect that I typically attach writing my goals on an annual basis; I looked at the same areas of life as I set my goals: career, education, health, social, financial and emotional/spiritual. In looking at each of the areas I then started asking myself, how do I learn and grow in my ability to meet me goals in these areas. The resulting mind map can be seen in this post. As I created the mind map, and thought about how technology has changed the way I learn, I see how even in the past few months through my courses at Walden University, I have become more equipped to learn in a vast, ever-changing world. I have been in the ID field for the past 5 years, and I have learned more in the past 4 months than in the rest of this time. Why? Because I have been introduced to the world of connectivism through blogs, online journals, and other technological resources, like mind maps, that have changed the way I look at how I learn. I would say that I have found the use of blogs and conversations with other ID professionals, even through the posts in my courses, the most beneficial. Learning from others and their experiences and having constructive conversation around the topics that are affecting my career and education has allowed me to grow in both my knowledge level and skills needed to be the best I can be at what I do. As I look at my personal learning network through my mind map, I have to agree that connectivism is a part of the learning scene now and that cannot be denied. One of the principles of connectivism is that “learning and knowledge rest in diversity of opinions” (Davis, Edmunds, & Bateman, 2008). I can see this in my mind map as I notice that I learn so much from others. I believe that having my opinion is important but when I hear from others through a variety of resources, their opinions are able to affect my own and sometime change them completely. Another principle is that “learning is a process of connecting specialized nodes or information sources” (Davis, Edmunds, & Bateman, 2008). My mind map is pretty extensive and clearly shows this principle of many nodes or information sources being used to learn. 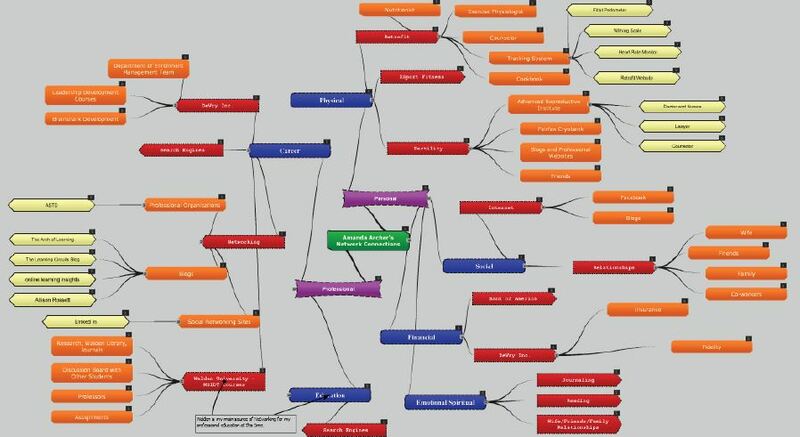 The clearest principle I am able to see by looking at my mind map of my personal learning network is that “nurturing and maintaining connections is needed to facilitate continual learning” (Davis, Edmunds, & Bateman, 2008). If I did not have the connections that I have, my learning would not be able to grow as effectively as it would with them. The truth of the matter is that in this day and age, “the span of time between learning something new, being able to apply it, and finding that it is outdated and no longer useful continues to decrease” (Davis, Edmunds, & Bateman, 2008). So, not nurturing and maintaining connections would mean losing out on the new and improved ways of thinking and doing things. We must always be thinking and improving as instructional designers. Connectivism seems to give a clear picture of how we can do this. Must View! Must Read! Check These Out! This week in my Learning Theories Instruction course we are looking at the topic of brain research and how it relates to learning. As I researched this topic I found a number of different resources that were helpful, including a number of blogs. I want to take a moment here and list a few of the professional resources, websites and journals, that I found most beneficial in my understanding of the topics this week in hope that they will benefit you as well! This website is a resource for many educational topics. You can access the New Horizons for Learning Journal that the school publishes electronically at no cost from the site. Concerning the specific topic of the brain and learning they have an entire section of the New Horizons site that is about Neurosciences. On this page you can find articles, recommended readings and additional websites that focus on the topic. In my view, any site that will give not only the information they teach but also resources for you to do your own research is one that can be invaluable. This site provides a variety of different resources concerning the brain and learning. 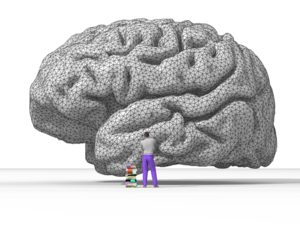 In the Education Connection page you can find specific articles that focus on how brain research is affecting education. Or, you can search their library for articles concerning different topics such as learning and memory, thinking and problem solving, and learning and behavior in the classroom. They have a link to reviews on books and websites on the study of the brain. There is a blog on the study of brain plasticity that has blog posts relating to learning and problem solving. You can also access games and brain teasers which are meant to challenge the brain and keep it active. The numerous resources found here make this site one to visit! This entire edition of this journal focuses on the neuroscience of adult learning. Starting with James Zull writing about how the brain learns, then Louis Cozolino and Susan Sprokay look at the connection between neuroscience and adult learning. Bruce Perry then covers the topic of fear and learning. And finally, Colin Ross at brain self-repair and how it has implications on education. I enjoyed this resource as a whole because it didn’t just focus on brain theory and learning as a general topic but focused in on how it affects the learning of adult learners. I accessed the journal through the Walden Library and would recommend it to anyone who works with adult learners. The final resource I would recommend on this topic of brain development and learning is a book that I also found through the Walden Library. This book takes this topic and makes it easy to understand through illustrations and examples that bring them to life. Literally, as I was reading this book, I found myself relating to the stories in a way that I understood the topic more clearly. Sprenger starts with a breakdown of the brain and how it works. She goes on to talk about how our memory works within our brain and then finally gives some specific examples of how understanding the brain can help to create effective instructional strategies. Of all of the resources I found through my research this week, this was one of the most beneficial to my learning. “The only evidence we have of learning is memory” (Sprenger, 1999). This being true, I hope that these resources will help you to not only learn about the brain and how it effects learning but that you can make it connect with your world and experience so that it becomes a part of your memory. And as these fascinating concepts become part of your memory and your thinking, as I hope they do in mine as well, I hope to see them start to change how we view the way we work as instructional designers. Let me know what you think of these resources if you get a chance to check them out! “Thousands of accomplished educators are now writing blogs about teaching and learning, bringing transparency to both the art and the science of their practice… And all of this collective knowledge is readily available for free” (Ferriter, 2009). What an incredible truth! I am so excited to begin participating in this knowledge field – both to contribute through my own blog, The Arch of Learning, and to start taking advantage of all of the resources available to me. As I started doing some research for l blogs to follow in the field of Instructional Design, I found there are a lot to choose from. I have chosen to follow a number of blogs, but I wanted to share three of them here and give a brief description of each one and how I feel they can give me an advantage and help me to be the best in my place in the instructional design world. The first blog site is The Learning Circuits Blog. This is a blog that is a community feature of Learning Circuits which is a newsletter from ASTD. The site allows anyone in the training and development field to share ideas and opinions about the state of learning and technology. Anyone can post on the blog and comment on the blogs posted. The latest blog post “Face Up To It: Are You the CBT Lady?” had me laughing as I have had similar experiences as the ones described in the blog. As I perused the other blog posts I knew I would have to follow this one. It has relevant information to the field and will give multiple viewpoints as it is an open forum as opposed to being just one author. I also like the idea of being able to post on the blog itself. Maybe one day I will get my confidence to the point of feeling I can do so! The second blog I would like to share is online learning insights. This blog is authored by Debbie Morrison. I was drawn to this blog because of the content, focusing on online learning as well as the volume, as Debbie seems to post to her blog on a regular basis. The topics of her blogs drew me in and made me think more about online learning in my world. I like that Debbie is an instructional designer in a world much like mine. It makes me feel as though I could not only learn from what she has to say but that I can also contribute to the conversation. The final blog I will list here is Allison Rossett. The name of the blog is the same as the author. She is a consultant in training and technology-based performance. I am immediately drawn to her because I would like to have this title myself one day. She also has an impressive list of credentials and experience. I feel as though I can learn a lot from Allison about the field of instructional design and this is why I am following her blog. Her most recent blog post “Consulting with executives to turn technology investments into results” drew me in right away! This is a topic, ROI, that is important in the field of Training and Development. The topics covered in the blog are varied throughout the T&D field and how it can be made more effective. This will definitely be one worth following! Ferriter, B. (2009). Learning with blogs and wikis. Educational Leadership, 66(5), 34–38.